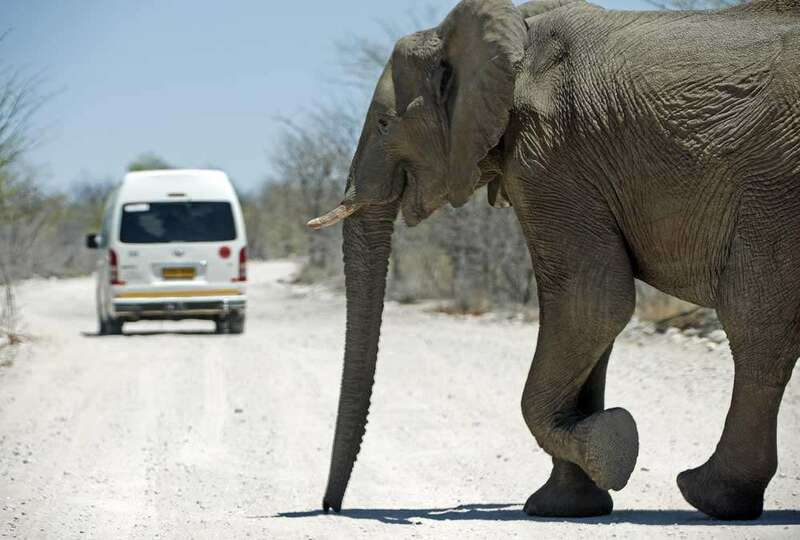 Every mile in Etosha brings surprises. 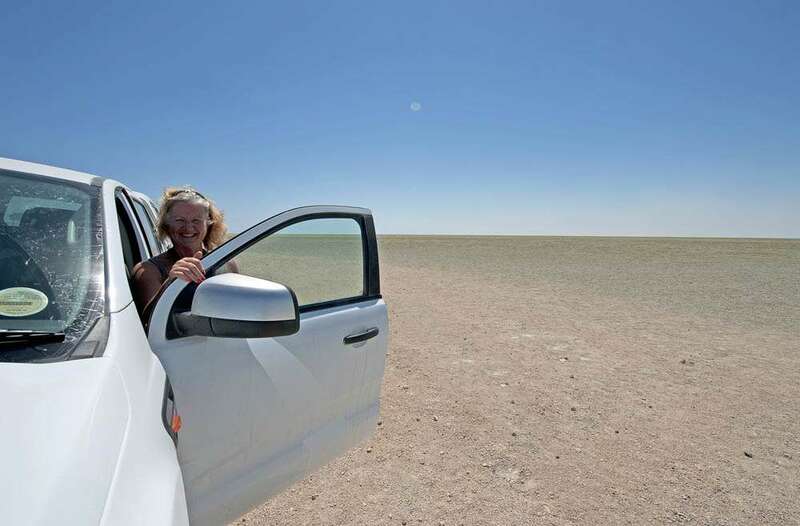 Etosha exceeded all our expectations – not only in wildlife sightings but also in the twelve hours we took to drive through it! 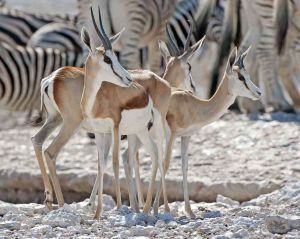 Etosha, in Namibia is outstanding simply because of the barren salt-pan wastes that seem to stretch to eternity. Surrounding the pans are similarly Spartan areas that amazingly sustain a plethora of wildlife in significant numbers. Although we love all wildlife and the environment in which it roams, we’d come to Etosha as one of the best places to see Cheetah; having been frustrated in our hunt for them in the other African countries we’ve visited. In order to give us the best chance of finding Cheetah we’d planned on driving ourselves for a full day through the eastern side of the national park – entering at Anderson Gate and leaving at Von Lindequist Gate. 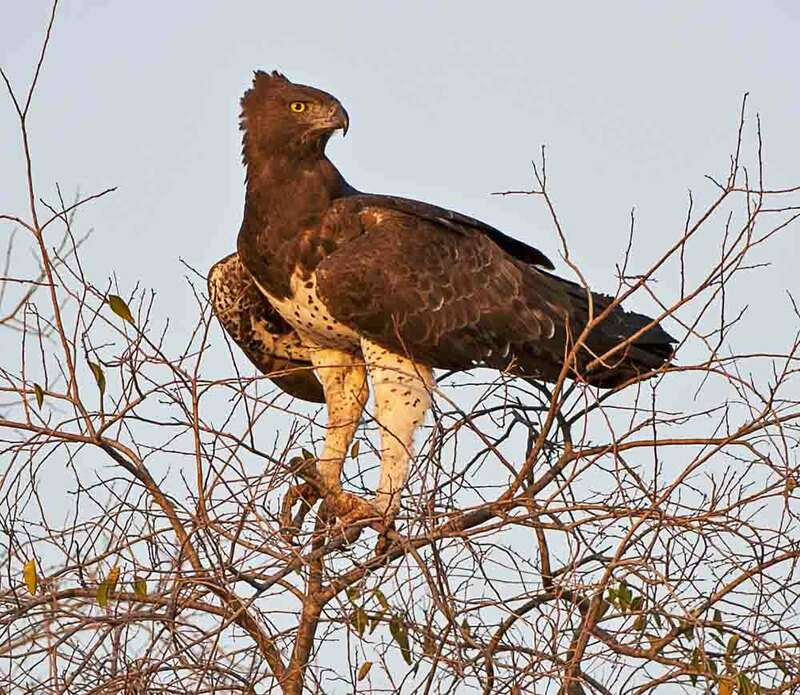 We intended to follow this up with two separate forays into the park with separate private safari drives on the following day. Hopefully we’d be successful. 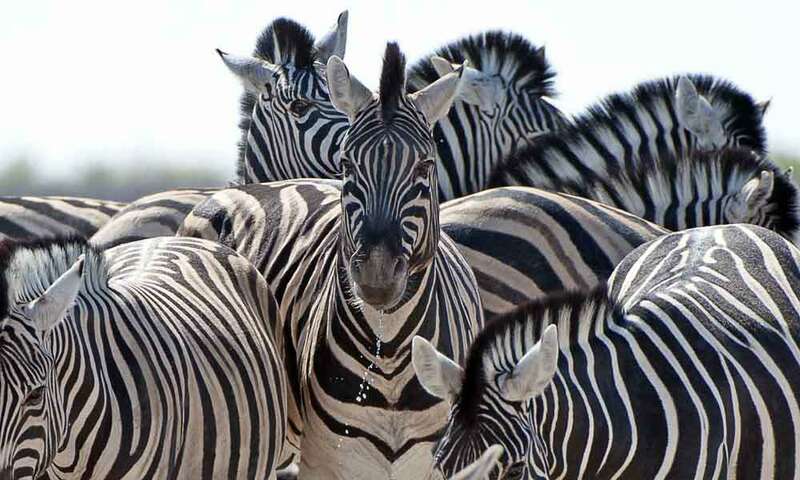 Namibia is a diverse country with an array of habitats and vegetation. 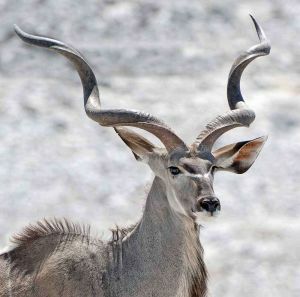 It is also one of the few countries where animals still roam freely, mostly unrestricted by human influence. Our short video gives you a feeling of the cross section of Namibian wildlife. The country has a great mix of desert, semi- desert and savannah. Etosha National Park itself offers a complete contrast of wide open grasslands, a massive pan that covers 4731km² and large camel thorn trees mixed with Mopani trees. This diverse vegetation accounts for the abundance of wildlife that thrives in the park. The original area of the park when it was first declared as National Park in 1907 was about 80,000 square kilometres (31,000 sq. ml) but this was subsequently reduced on a couple of occasions until 1970 when it remained at 55,000 square kilometres (21,000 sq. ml). Whatever its actual size, the perception was that a day’s drive would be exhausting. In order to reach Anderson’s Gate by sunrise and be one of the first vehicles through it we had to awake at 4.30am so that we could drive the 70kms from our lodge to the gate. Better planning would have placed us closer to the main gate for the night before. The sun was peering over the treetops as Anderson Gate opened and as second car through we had a clear road ahead. 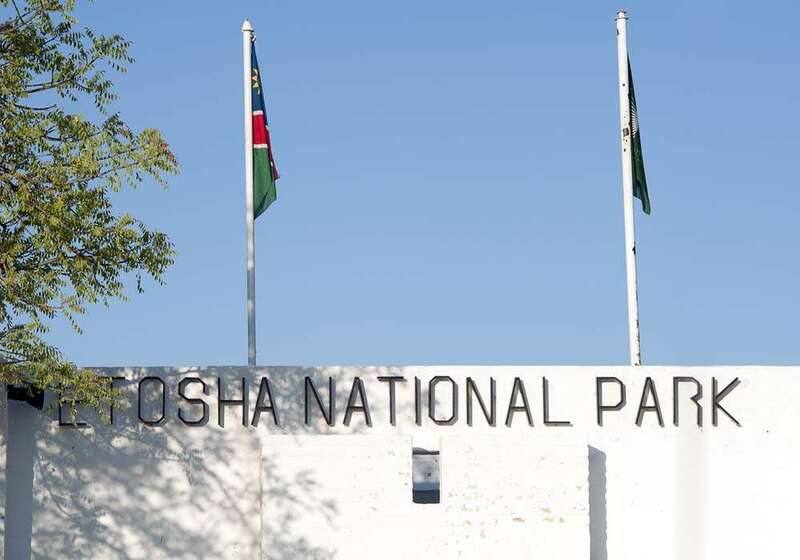 Of particular note here is that you are permitted into the park with your vehicle, simply by giving its registration number. 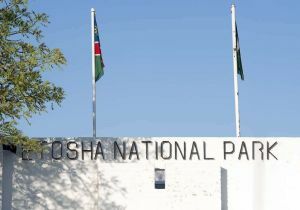 The first main camp within the park at Okaukuejo – some 16kms drive – is where you pay for entry. This avoids long queues of frustrated photographers and visitors waiting to pay at the gate and missing the best minutes, if not hour, of light in the early morning. It also means that vehicles have spaced themselves out over the 16kms so waiting is minimal at Okaukuejo as well. 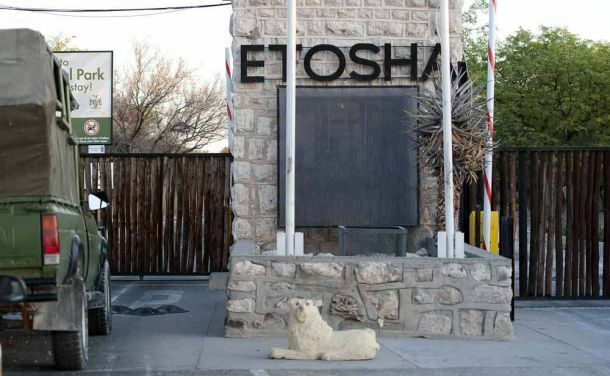 Well done Etosha! 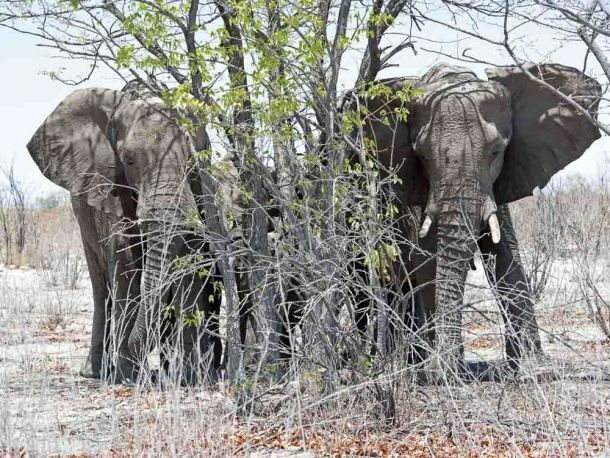 No sooner are we in the park than we see a small herd of elephant in the bush at the roadside. We wait quietly – but anxious to protect their young, the mothers gather them together behind an acacia tree and peer around the undergrowth at us with ears extended. We drive on, little realising that this was almost the last time we’d see elephant – or bush for that matter! Being new to this park, we were uncertain of how long it would take to drive through it. We knew that we had a maximum of twelve hours before the park closed in order to get to Von Lindequist gate approx. 250kms away. At a maximum permitted speed of 60kmph we estimated that, allowing for frequent stops, we’d take about 6-7hrs. Although we monitored our progress loosely, we hadn’t expected that the journey would in fact take us virtually the full twelve hours! It’s impossible to predict what you’re going to see where and when, so it’s a constant dilemma as to how long you spend in any one place. As you can see, we tended to spend as long as we felt each sighting justified and were one of the last vehicles to leave the park! 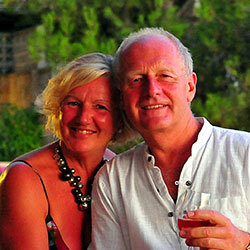 Time flies when you’re enjoying yourself – even though we were pretty wasted by the time we reached the exit. Nevertheless, having paid our dues at Okaukuejo we immediately turned off the harder ground and headed on dusty tracks towards Olifantsbad. 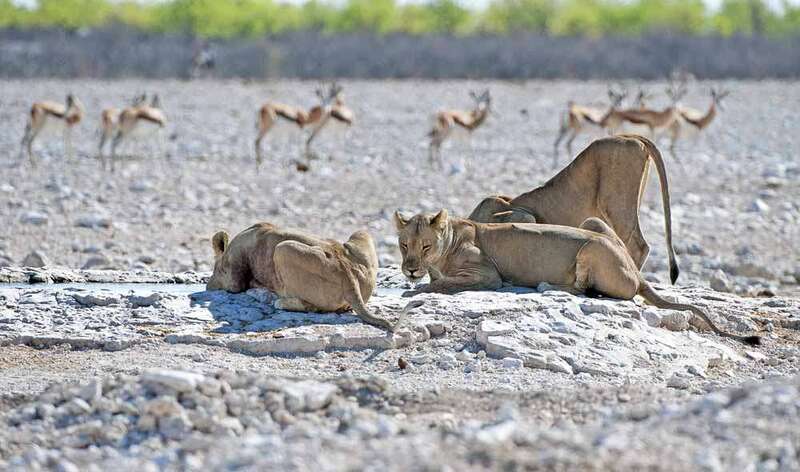 As it was still early in the morning and we were in Etosha at the end of winter (November), we felt that the waterholes would provide the best wildlife viewing as water would be scarce in the park. 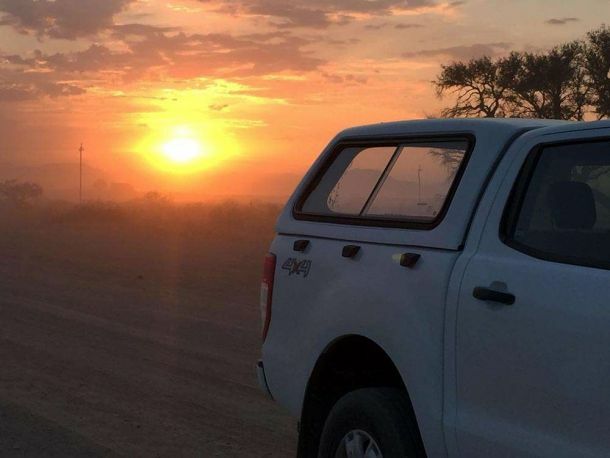 As we neared Gemsbokvlakte waterhole we paused behind another stopped vehicle – always a good idea as they may have seen something that you haven’t. Sure enough, lolloping across the plain towards the water hole was a lioness. We sat, mesmerised for a good ten minutes as she walked towards us, obviously full from a recent feast. 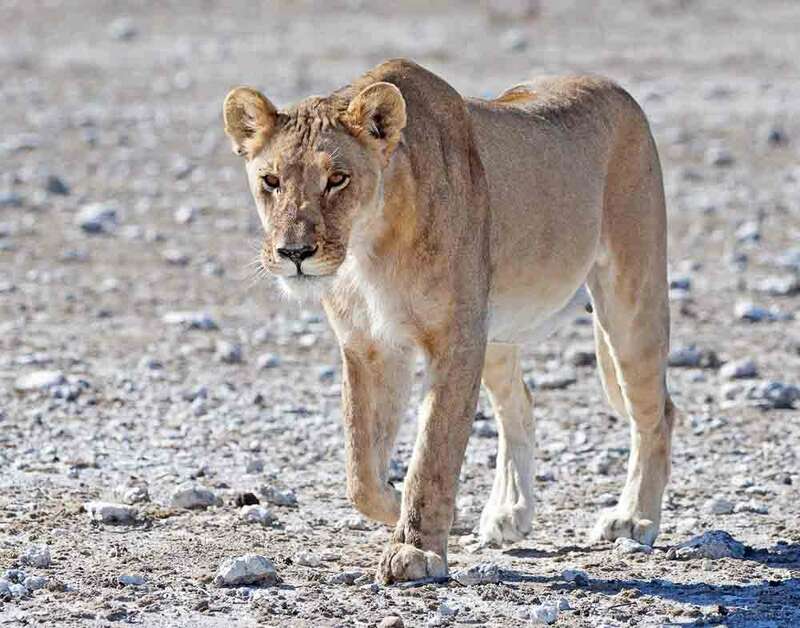 As she passed immediately beside our vehicle we saw another two lionesses approaching from the same direction and they eventually joined their companion at the waterhole; which had been rapidly vacated by the herds of Springbok and Zebra who now stood at a safe distance whilst the three lionesses drank their fill – a magnificent sighting so soon on our drive. With the departure of the lionesses to rest at a distant vantage point, the herds of prey resumed to their places at the waterhole. The time of year was paying dividends as we’ve never seen so many animals of differing species in one place before. 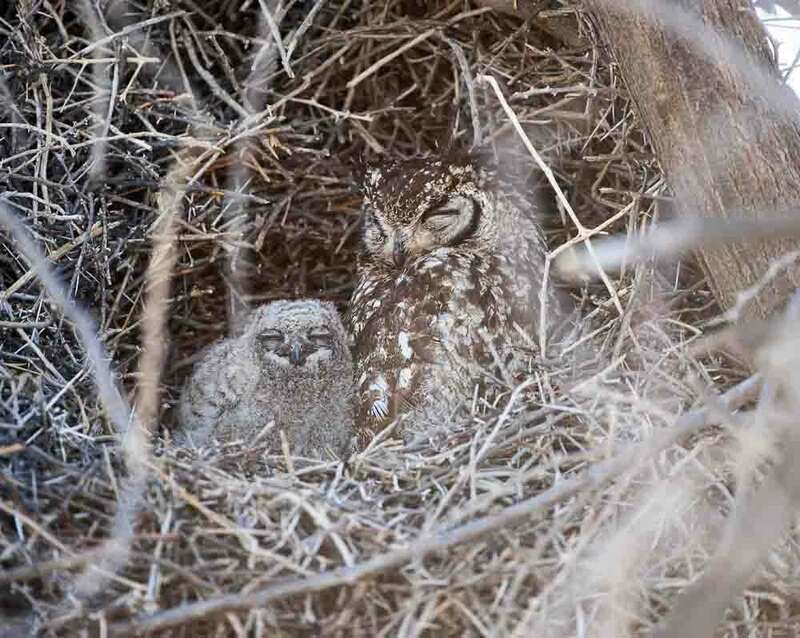 Moving on, we again paused by another stationary vehicle but as we were behind it were lucky enough to see a Spotted Eagle Owl mother and chick in a nest adjacent to the car. 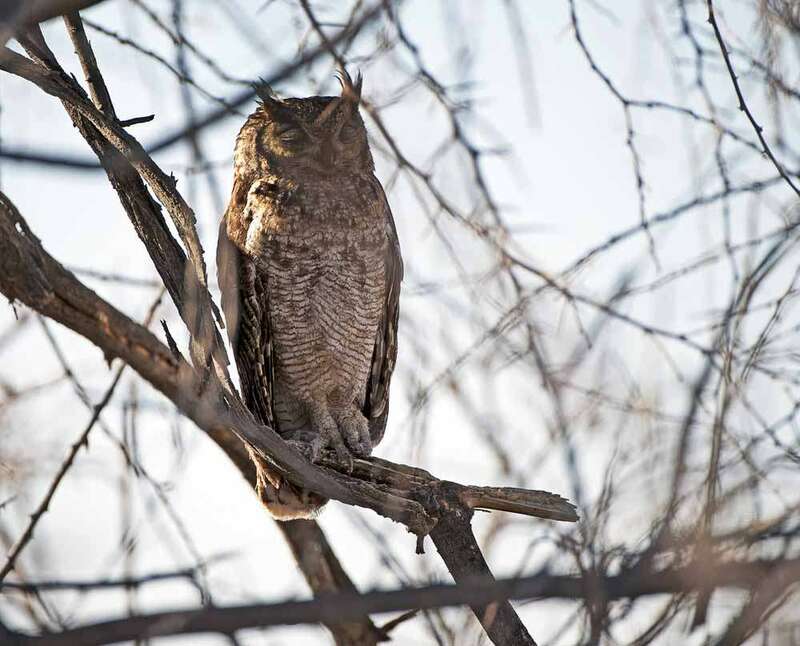 The occupant of the car in front was looking at the male Owl in a more distant tree. A rare sighting for us, so close to the ground, the Owls having usurped a Social Weaver Birds’ nest. 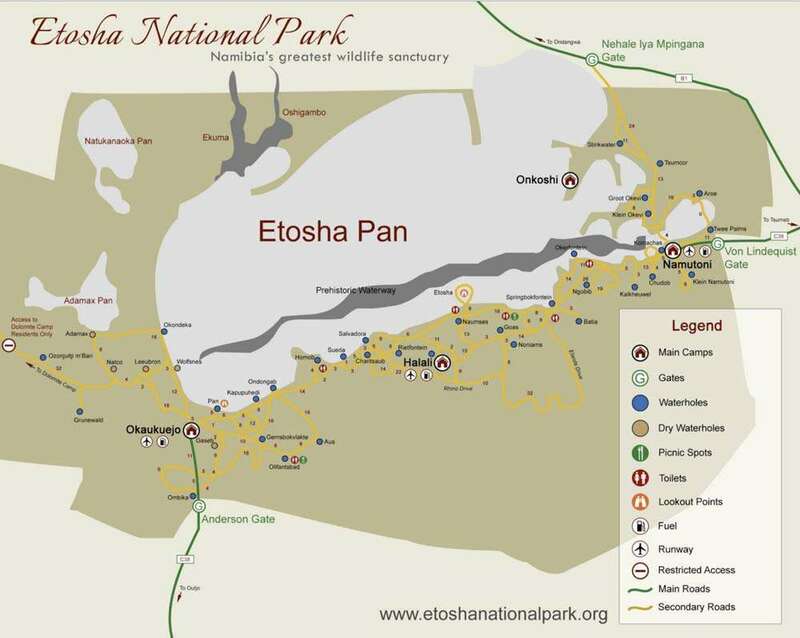 Driving in Erosha can easily be achieved in a normal two wheel drive vehicle – your only consideration really being ease of visibility from it, both in terms of size of windows and distance from the ground as a higher vantage point is often advantageous. Whatever you drive you’re bound to end up with a film of fine clay and salt dust covering everything inside and out if you’re there during the winter months. It’s a common courtesy to drive very slowly if you wish to pass a stationary vehicle (assuming you don’t want to see what they’re looking at) and to be wary of passing open jeeps at speed, as the people in them don’t take kindly to being obliterated by a dust cloud. That said, it’s amazing how little other drivers adhere to this simple consideration. On this occasion we were fine, as we could wind our windows up – but the next day we were often smothered by a dust cloud. If passing other vehicles at speed however, we were told the simple tip of pressing your fist against the windscreen – as it acts as a damper (similar to a tennis racket damper) in case stones hit the window – so you only sustain a chip instead of a spider web crack. It does work – even if approaching cars do always think you’re waving at them! 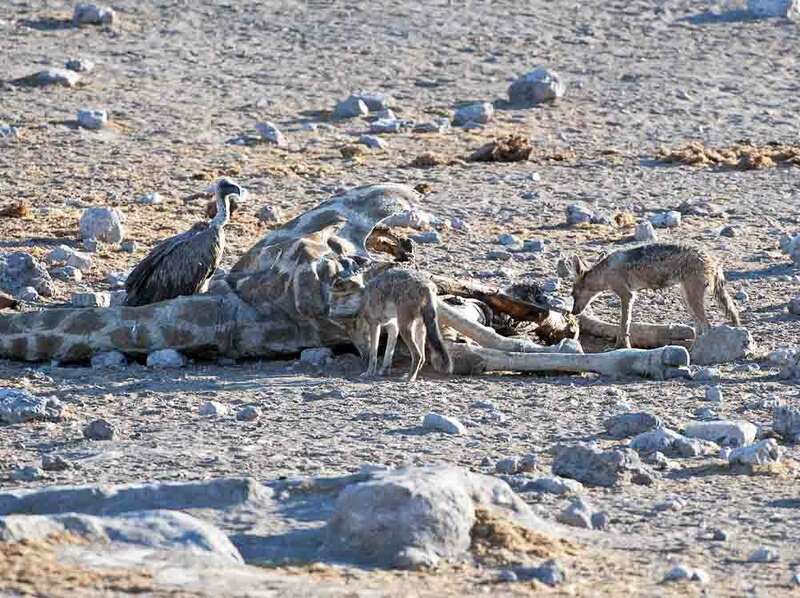 Fortunately Etosha, unlike the rest of Namibia, does have regularly spaced fuel stops and a central watering hole for humans at Halali where you can get a basic two/three course meal and indifferent service. By the time we reached it, after a detour along Rhino Drive, we were ready to get out of the vehicle to stretch our legs, whatever the catering facilities, as it’s not permitted elsewhere unless you locate one of the relatively scarce and rudimentary toilet enclosures. As it was now about 2pm, we thought we would get some distance under our belts in order to catch up some of the time we’d spent at numerous wildlife sightings. This was in the belief that as with other nature reserves, most wildlife heads for shade during the heat of the day, only to reappear at dusk. We were wrong. In Etosha it would appear that either because of the dearth of available shade or the adaption of the wildlife (or both) we saw as many animals during the midday heat as we did at either end of the day. This may also have something to do with drinking and grazing safely while predators rest. Birds and mammals of all kinds graced us with their presence and all within fifty, if not five, metres of our car. This, of course, played havoc with our scheduling of the journey and as the hours rolled by we realised that we were going to be using every available minute of the twelve hour window. 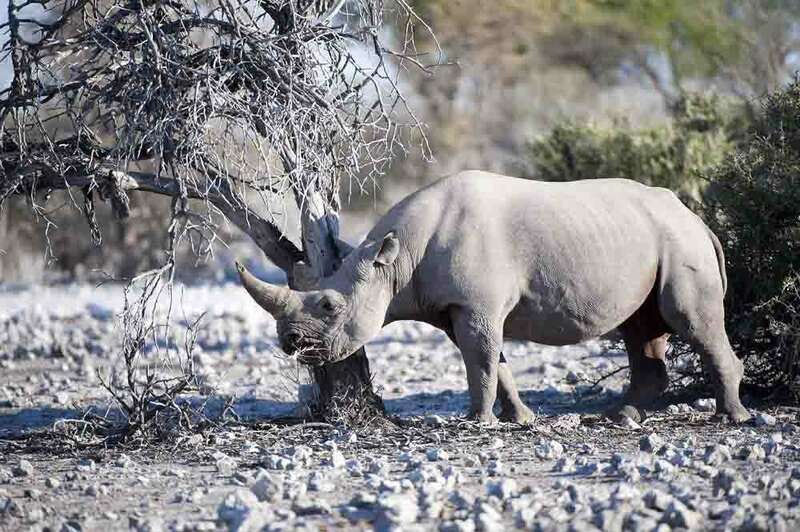 Nearing the end of the day, we joked that we had seen everything with the exception of Cheetah (once again) although Cherrie reminded us that we hadn’t seen the rare Black Rhino either – until we rounded the next corner to Klein Namutoni waterhole. Standing grazing not ten metres away from us was a magnificent Black Rhino in plain sight. Feeling very grateful for this last sighting we were both tired and relaxed as we exited the park on this first day and headed to the welcome sanctuary of luxury tented accommodation at Mushara – this time, thankfully, only ten minutes’ drive away. Our second day was successful in that we eventually saw Cheetah – well, we actually spent extended time in the company of a Cheetah mother with two three month old cubs – so it was hugely rewarding simply as a consequence of our guide having been tipped off in which region to look by the ‘guide radio-grapevine’. 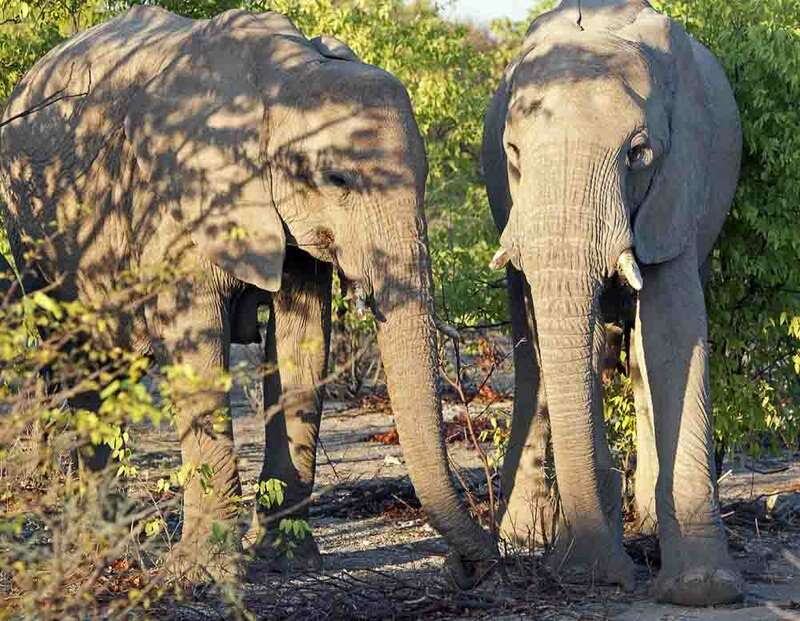 However, we have to say that although we wouldn’t have missed this opportunity for the world, we so much more enjoyed the freedom and independence of choosing our own routes, setting our own timing and discovering our own wildlife whilst exploring Etosha ourselves. It’s often far too easy to talk yourself out of an adventure because of uncertainty. 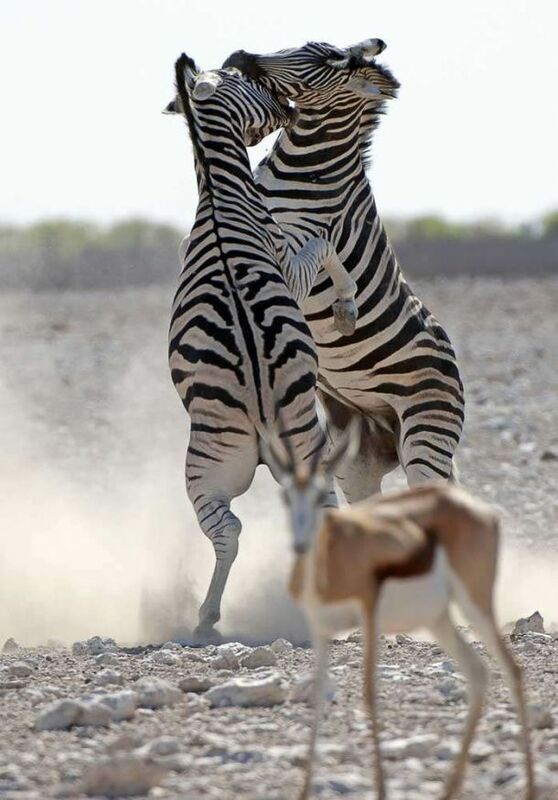 Namibia and Etosha need not daunt you. Go and discover it for yourself! 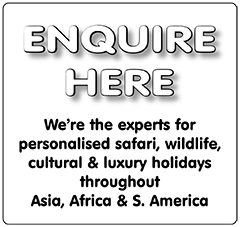 Let us help plan your holiday to Namibia and Africa! 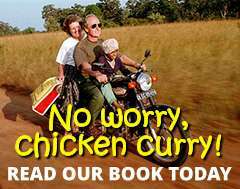 Why not download our guide brochure or give us a call today on 01202 030443, or simply click ‘enquire’ to let us know where you’d love to go? The Etosha website has to be one of the most comprehensive that we’ve come across for a national park and well worth looking at if you’re planning a visit. As well as an excellent map for download it gives an accurate precis of the history, wildlife and areas of the park including accommodation and seasonal variations.